In New York, everyone has an opinion about pizza. With so many styles and tastes it’s easy to find yourself arguing about who’s is best. 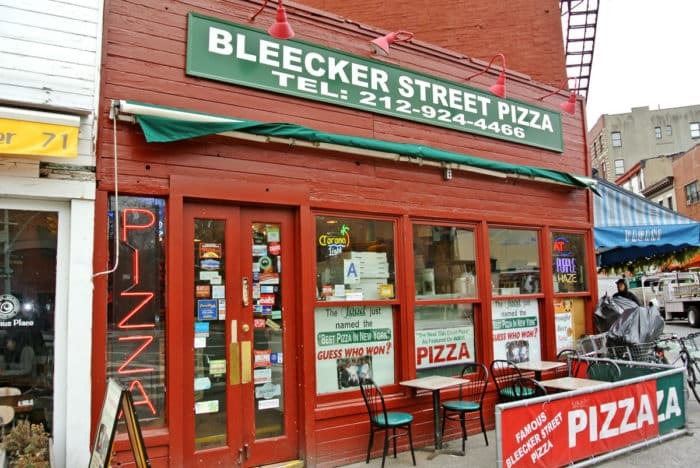 For my money, the best slices in NYC come from Bleecker Street Pizza. From the outside Bleecker Street Pizza looks like any old pizza shop. It would be pretty easy to walk right past it despite its bold red facade and signage claiming they have the best pizza in New York. This would be a big mistake. 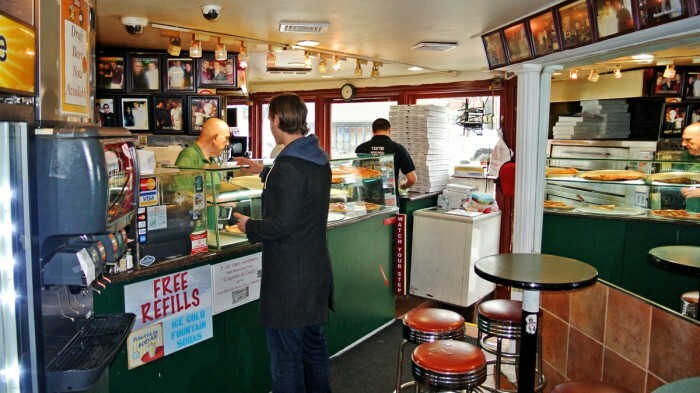 This tiny shop does New York pizza right. It’s a simple, no frills shop with pizza boxes, fridges filled with soda, celebrity photos lining the walls, and a few small tables in the back, but their food is spot on. This is not the kind of place you’d come to for a sit down dinner, but that’s no surprise. It’s a pizza shop, not a pizza restaurant. It is, however, destined to become my goto place to bring pizza starved out-of-towners. 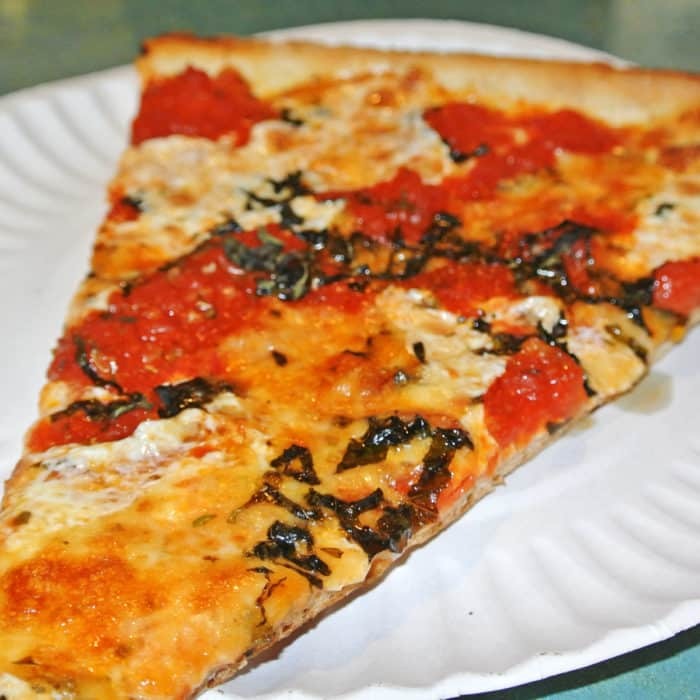 You can hardly go wrong with any of their slices, but I urge you to make the Nonna Maria one of your selections. This classic grandma-style slice is, in my opinion, the pinnacle of pizza slice perfection. This thin slice is sturdy with a crispy cracker stiffness solid enough to hold up the delicious, fresh toppings without sagging. There is no folding necessary to hold this slice together. On top you’ll find a really fresh, bright, sweet, garlicky, chunky homemade tomato sauce along with fresh, melty mozzarella cheese and herbaceous ribbons of basil. I know you’re probably used to adding parmesan, red pepper, garlic, or oregano to your slices, but here there’s no need. The flavors and textures are bold and balanced and require none of the usual fiddling. For something heftier, give the Pepperoni & Sausage Slice a shot. Here you’ll really appreciate the stiff underside and its ability to support the weight of the meaty Italian toppings. 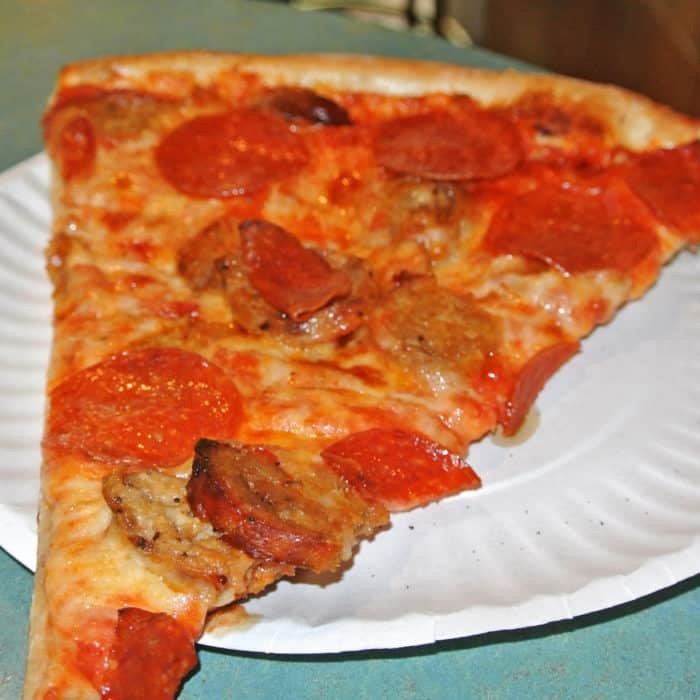 They are very generous with the amount of pepperoni and thick sausage they scatter across the slice. The pepperoni has that spicy, greasy flavor that I often crave and the meaty fennel seed studded sausage pairs well. While I was there, Greg came out from behind the counter to chat with me after noticing I was snapping photos. Once I finished eating, he asked if I wanted to get a picture with the pizza behind the counter and I of course excitedly accepted the offer. I stepped behind the counter and joined Tony for a shot with their signature rectangular grandma pie. I’ll definitely be back for one of these slices soon! 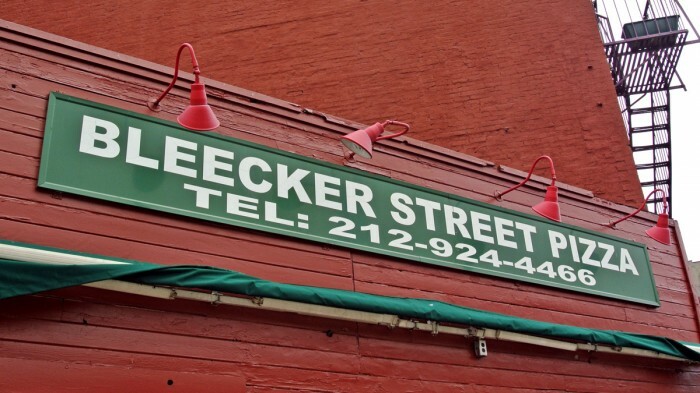 So, if you want to have the best pizza New York has to offer, Bleecker Street Pizza is the place. Don’t miss the elegantly simple Nonna Maria Slice and don’t forget to brag to all of your friends about how you’ve had the best. 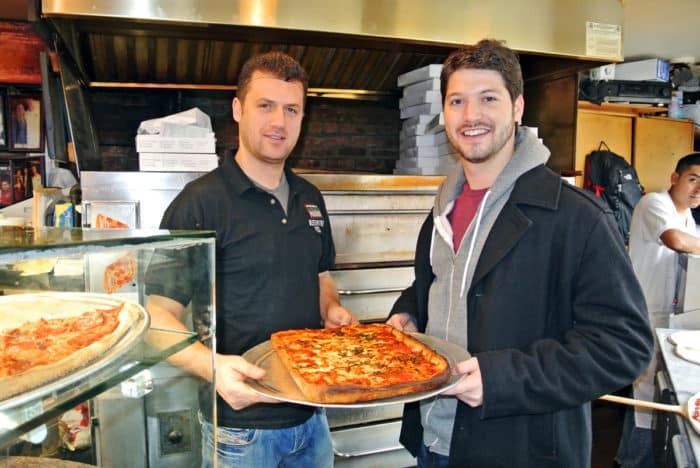 Think you’ve got a spot in New York with even better pizza? Let me know in the comments below.